Young Tiger NTR is presently busy with shooting part of his upcoming flick “Janatha Garage”. Now the latest news is that Jr.NTR Janatha Garage Movie Release Date announced. Janatha Garage is being directed by Koratala Siva. Everybody is familiar with Mirchi and Srimanthudu movie blockbusters delivered by Koratala Siva. The movie makers have announced the release on 1st September 2016. 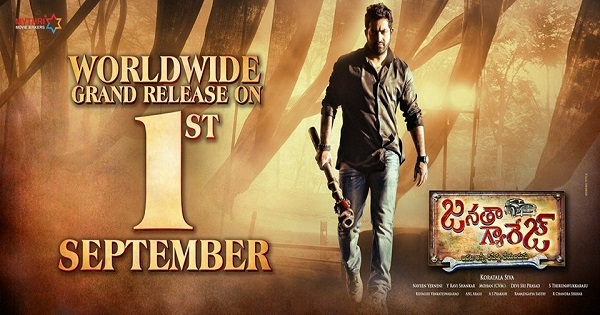 The decision of film makers movie release date of Jr.NTR Janatha Garage movie declared. Koratala Siva says most of the movie shooting is completed for post production taking time for that movie release delayed. NTR Fans disappointed for movie postponing, but every ntr fan will feel proud after watching Janatha Garage. In Telugu film industry Jr NTR is one of the well prominent veteran actors. Everyone is waiting for his next movie eagerly. So we have to wait some more time to see Our young tiger on a bigger screen. Janatha Garage movie is being directed by Koratala Siva and is produced by Naveen Yerneni, Y. Ravi Shankar, C. V. Mohan. Samantha Ruth Prabhu and Nithya Menen are playing in two lead characters. Devi Sri Prasad is composing the music and the film is being produced under Mythri Movie Makers. The film is planned to hit the silver screen on 1st September 2016.